Stavros Villas is situated in Karterados, a traditional village on the outskirts of Fira, the islands capital. The Villas offer its guests traditional Greek hospitality within modern comforts for an unforgettable holiday on Santorini. Stavros Villas are located at the suburbs of the capital, within walking distance of the centre, few minutes (30min) away from the beach of Karterados. 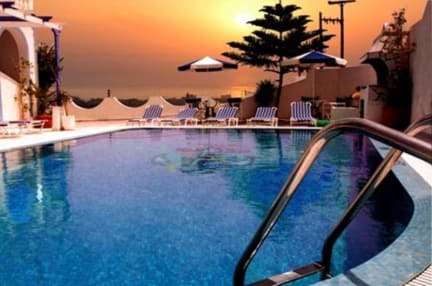 Consisting of 15 rooms with private bathroom, fridge, television and air conditioning. 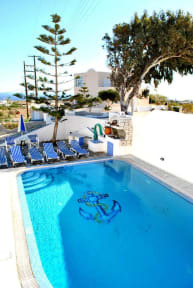 Stavros Villas has a great swimming pool and sunbeds with umbrellas around it. The swimming pool is open during the summer time. Next to the reception is the breakfast and lounge area also with television. Island excursions and car or moped rental can be arranged and there is also a laundry service available. Rooms are cleaned daily and there is hot water available 24 hours. At Stavros Villas we offer a friendly, and relaxed atmosphere. Our staff will be happy to provide you with tourist information on Santorini and its surrounding areas. Internet WI-FI for free 24 hours in the rooms. Payment by cash on arrival day. Cancellation policy: 7DAYS advance notice. Late cancellation & No show = full charge of total amount. Important information:From 1th of june to 30th of september the cancellation policy is 21 days advance notice.